Besides the obvious things like the addition of xc and dressage work to our repertoire, the extreme amount of tack I now own, and the change of barns/trainers, I looked back and realized that some other things have changed too. Mostly little things, a few bigger things, but it’s funny how a change of sport can sometimes mean a change of perspective and shift in priorities. 1) Henry is hairier. I’ve never been a fan of clipping whiskers, but whiskery noses and hairy ears at h/j shows just aren’t really done. Well… Henry always kept his ear hair but I hid it under bonnets. Now the only things that get clipped are his fetlocks and bridlepath. And in the winter he can keep his leg hair, or even get a trace clip, and that’s totally normal. Long live leg hair and nose whiskers – I don’t like how you look but I appreciate why you’re there. 2) Henry is fitter/thinner. Now that we finally got his diet fixed, he’s leveled out at a good healthy weight. And I don’t mean hunter fat as in “there might be ribs under there somewhere”, but an actual honest to god correct weight with just the hint of a rib. He does conditioning work regularly with trot and canter sets and is more fit, even with our limited riding schedule this spring, than he’s ever been since I’ve owned him. 3) I’m more obsessive. I’ve always been a crazy person about legs and feet, but now it’s a little off the charts. I know every bump and lump on Henry’s legs more than I know my own. This is a hard sport and we do it on all kinds of footing. The obsession is warranted. How long can one person spend researching different ice boots, crippled by indecision? Answer: 5 months and counting. 4) Along the same lines, the importance of certain things has changed. What used to be concern over a sunbleached coat is no longer – now the concern is having him spend as much time outside and walking around as possible. They only come in when the weather makes it necessary – be it extreme cold or heat or storms. Sure he’s a little yellower than he used to be, and his tail is looking kinda orange, but I couldn’t care less. 5) We jump less. I used to jump 3 days a week. Now it’s once, maybe twice. There’s just so much other stuff to work on, and so much to DO. And honestly – as the rest of it gets better, the jumps get better too. All the crosstraining really compliments each other. 6) Safety issues that were once kinda on my radar are now front and center. Eventing is dangerous. There’s just no way to argue that galloping over solid fences is the safest sport one could choose to do on horseback. So while it’s been years since I swung a leg over a horse without a helmet, now I’ve found myself researching safety standards, comparing ratings, paying more attention to the “expiration dates” on my equipment, etc. 7) I wear what I want. Let’s be honest, eventers have a reputation for being a little crazy and often borderline tacky. I figure you can either be offended by that, or you can embrace it. I choose to embrace it. I never would have incorporated yellow into my color scheme if I was still in the jumper ring, and I sure wouldn’t have bought white breeches with sparklies all over the back pockets. I might not even have any PS of Sweden bridles (the horror). But I love them and I give zero shits if anyone else does. I mean, what else would you expect from an eventer, right? So liberating. 8) I’ve gotten used to “going it alone”. I can count on one hand the number of h/j shows I ever went to without a trainer. It just isn’t really done, and the few people that DO do it are usually the ones that really need a trainer. But in eventing it’s not uncommon, and I feel like I’ve actually learned a lot more about my horse and myself this spring as we’ve gone to all of these events (except one) without a trainer. I’ve had to really learn what works best to warm Henry up, what I need to get myself mentally ready, and how to be confident and do a good job on my own. To be honest, I’ve come to prefer it. Lessons are what we do at home. Executing what we’ve learned is what we do at shows. Being able to focus 100% on myself and my horse, to think for myself, to use my own judgment, and to learn to trust that judgment – it’s awesome. It’s built up my confidence a lot. 9) I appreciate my horse more for what he can do and focus a lot less on what he can’t. Henry is not the scopiest horse in the world. In Jumperland, he’s a Low Adult horse and that’s the end of it. He also isn’t particularly fast, so he’s not the winner in the jumpers. As an eventer, he has a lot more going for him. His dressage, while still average, continues to improve. Although he isn’t a fancy mover, he still has the potential for good scores as he gets more and more steady and correct. He’s careful enough (and so rideable) to be good in stadium, and while not immune to a random rider-error rail here or there, generally he tries not to touch anything. Of course, XC is where he really shines. I am so appreciative of his bravery and willingness – things I never would have known the true depths of if we’d stayed in the jumper ring. As a jumper I liked him. As an eventer I adore him. 10) I have more opportunities. Partly because of the above, but mostly because it’s a cheaper sport. Let’s face it, never in my life would I have had 8 A-rated jumper shows on my calendar in one year without winning the lottery. But I can do recognized events for HALF the cost (or even less), so I can compete at the recognized level without my bank account laughing itself to death. I also never in a million years would have found myself qualified for and attending a national championship competition in h/j land. Never. But here we are. And we’re not limited to just this year… the opportunity exists next year and the year after that, on and on. It’s a little surreal and really really fun. There are some things I miss about h/j land, don’t get me wrong. But change is has been good, and it’s fun, and it’s the right thing for the horse. To be honest, it’s been a breathe of fresh air for me too. Thanks Henry for the journey. Next What about all those goals, anyway? Loved your perspective on the differences between h/j land and eventing! I’m noticing a lot of the same shifts for myself as well. I love this! Except I think it’s funny you find eventing cheaper, and I find it the most expensive thing I’ve ever done. ;D maybe it’s your location, but here, even if the entry fee is cheap, the travel/trainer fees/whatever all adds up quick. We have one localish event, but everything else is 3-5 hours away. Plus ALL OF THE EXTRA TACK. I feel like you can get away with cheaper clothes/gear in hunter shows, even though its looked down upon. 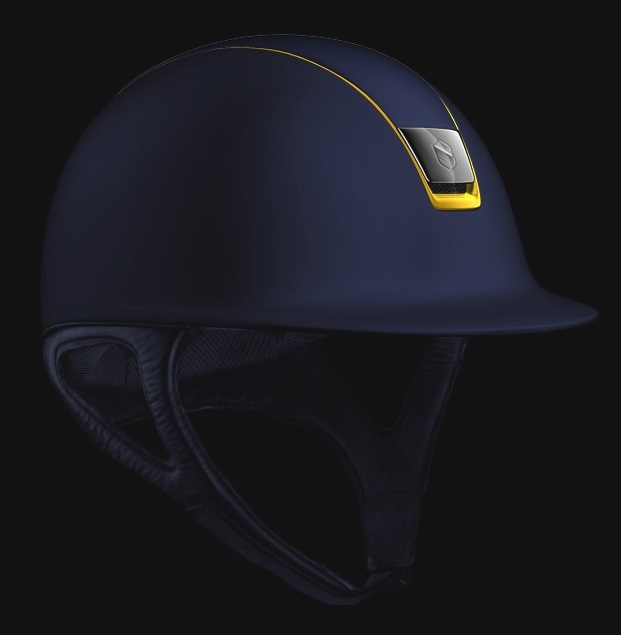 So sure, if you get the tailored sportsman and GPA you’re financially sunk, but as you climb the levels in eventing, the cheap tack/equipment doesn’t cut it, and the costs really start to add up. Or so I’ve found. Sigh. All of our events are 2-4 hours away and multi-day, so that’s a big chunk of the cost. But I’m not paying the trainer fees that I was paying with h/j shows, and all my friends have trucks and trailers so it’s considerably cheaper for me to pay for gas than it is to pay what a trainer typically charges to haul. H/J was considerably more expensive for me. The tack, while I do have more of it now, is a negligible cost, all things considered. You aren’t buying all new stuff every month. I actually broke out the costs of each type of show in a post a while back… “an overly personal look into horse show costs”. You can see how it breaks down for me. I never walked away from an A rated h/j show having spent less than $1400, but I can go to a recognized event for $600-700. Huge savings for me. I only did one A rated show (and I catch rode so I didn’t pay the bills)- I had no idea they were that expensive!! As an endurance rider beginning to explore and dabble within the eventing world, I really enjoyed this post. Also, HI. I’ll quit lurking and begin commenting starting now. Haha. I really enjoy your blog, writing, humor, and Henry. It all sounds great to me! The cross training is absolutely my favorite thing about eventing, personally. Well that and the people. I’m hoping all those ice boots photos mean a review is coming soon.. I’m shopping around right now and would love a comparison post about what’s out there! Awww, what a great post 🙂 It’s been awesome to watch the transformation of both you and Henry when you became eventers. I think he really shines in XC, and you still get to do the jumper-y stuff in stadium, so it’s a win-win! The changes, large or small, that have happened since you started eventing with Henry are really interesting, most of which I never would have thought about. I always love when bloggers gush over their horses, and this post is just that! 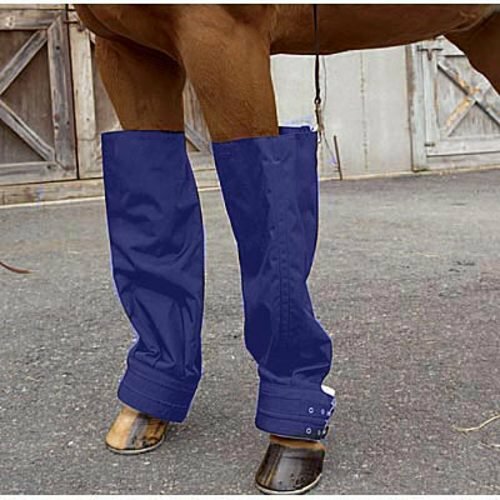 I don’t know if this helps or not, but we use the Equipro 9 Pocket Ice Boots. They look like a lot of the other ice boots out there, but are a much higher quality. As much as we use ice boots, most pairs only last a year before the the part where the Velcro is attached to the neoprene starts to stretch out and rip. The Equipros usually last 4-5 years. They also fit and stay up better. We don’t order the suspenders, but that’s an option if you’re worried about them staying up. They cover higher on the knee down to the ankle (I find some ice boots too short). We use their bell boots too, which look stupidly simple, but are also good quality. Anyway, for what it’s worth, that would be my recommendation. can you have a freezer at the barn? if so look on craigslist you can pick up a cheap older chest freezer for about 50 bucks and then you can keep ice in it. Might be worth it if a bunch of you are interested in ice boots! No, there’s really nowhere to put it. FWIW, I love that you’re embracing the colors and fun of eventing. I think people who don’t miss half the fun. Ha, yeah, working on one of those too. This is a great list! I may steal this or a hunter variation of it for a post. Great post! It’s been so cool to follow your journey with Henry into eventing 🙂 I hope to be out there myself next season! Love this! Although I’m obviously on a different path (hunters to dressage, not jumpers to eventing) I relate to a lot of this. There are things I miss, things I’m grateful for now, things I didn’t know I loved about my horse before, and mostly a lot of stuff that works better for us these days. Love when you can think outside the box and something new and better comes along! Love that you both found something you love!!! The confidence issue is an interesting one. I hadn’t really thought about it, but what I LOVED about eventing (and PC specifically) as a kid was being responsible for myself and knowing that my success (or distinct lack of success) was a direct result of ME. While I am loving the support of a full time H/J trainer now, I have noticed that I am less assertive at shows and have allowed my trainer to become a mental crutch for me. When we first started in Hunter Land it never occurred to me to wait for my trainer for a round (oops). Now I get panicky if I can’t find her…. I should probably think about that more. Love your list, completely agree, and especially love how it has changed your feelings towards Henry. A sport where he shines and so much teamwork is needed is amazing for that relationship. 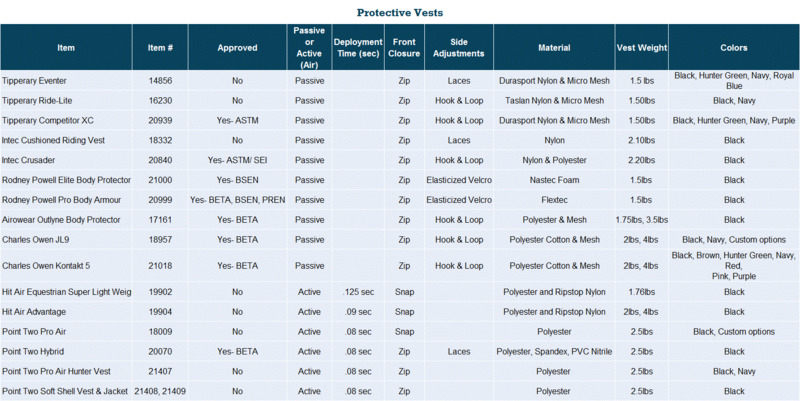 Where is that vest comparison spreadsheet from? I have gotten to ride with some great instructors as well this last year (cross country schooling with Sally Cousins is incredible and fun and walking besides those HUGE Fair Hill In’tl jumps makes your stomach lurch on how lucky you are you don’t HAVE to jump them! :)) So I am lucky. However, I also know me and I need a person (or persons!) to guide me along the way and with my friends here and Amanda’s blog I feel guided! Thanks for taking Henry (AND ALL OF US) on that special ride!